Are you exploring a new phone system for your business? Setting it up isn’t as complicated as you might think. Click here to learn how to get a business phone number, extensions and everything else about your new phone system. So, you’ve opened your doors for business. You’re ready and excited for new customers and to get things going! Maybe you’re setting up systems and thinking about getting a phone just for your business. When you’re setting up a new business phone system, you don’t want to put yourself in line for a headache. As a small business or startup owner, you want something easy and quick. You might be asking yourself a wide variety of questions. How do you set up a phone system? How do you get a business phone number? How do I choose what system is right for me? We’re going to answer those questions for you today. Before you get started with setting up your business phone system, you need to choose one. Whether you’re a startup or a small business, one dropped call can make a difference between happy customers and extremely frustrated ones. There are two basic kinds of phone systems. Multiline and private branch exchange. These are similar, but they differ in how complex they are. With a multiline phone, you can have about 8-10 individual lines coming into one phone, and each of those shows up on each phone extension in the office. These require manual operation. A private branch exchange, or PBX, system, is an automatic phone system that much larger businesses use. PBX systems will let you add additional lines and automation, ensuring you won’t need a central receptionist. Multiline phones work different depending on what options are available. In a basic system, every line has a separate phone number. You will publish each number and use it as a separate line. The line receiving the call will ring and a light will blink. But if the line is in use, the caller gets a busy signal or their call will be sent to voicemail. Another option is a rollover. With this, you’ll only publish one number and each of the calls will take up the other lines as they wait for their turn. For example. if you have three incoming lines and two people call at once, one call will ring on line 1 and one will ring on line 2. Both of these options offer features like voicemail and transferable calls. There’s also usually a speaker system, allowing receptionists to let employees know about incoming calls. A PBX phone system does the same things as a multiline system, but it does them without needing a human to operate it. The incoming calls come in through an electronic receiving area and then the caller will be able to dial an extension or listen to a list of extensions to connect through. If the caller dials one of the extensions directly, they can avoid the system and connect to the person they’re trying to reach. 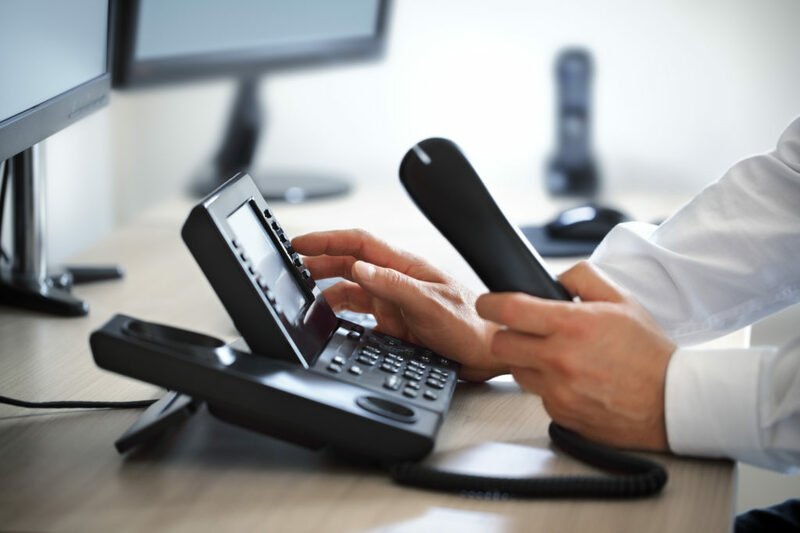 PBX phone systems can also let people connect internally. Employees will be able to use the phone to call other extensions in the office without having to use an outside line. This is usually done by dialing the last three digits of the number. To access an outside line, PBX systems require you add one extra number before placing the call. A business phone number lets clients contact your business for services or goods. These numbers can be toll-free, so they can call for free no matter where they’re at, or it can just be a local phone number with an area code. No matter what type you choose, it’s important to set these numbers up early when you’re creating your business. First, decide who you want to pay for long distance calls to your business. If you want people out of state to call, you might want a toll-free number that ensures that the business will pay for the coll. These numbers usually begin with 1-800 or 1-866, which will allow people to call and not get billed. However, if your business is local, you’ll be fine with a local phone number. Determine if you need a “vanity” number. These are numbers that include words that make it more memorable for clients and potential customers. A vanity number for a phone company might be 800-344-CELL. Traditional companies that run landlines will let you ask about vanity numbers and Google Voice allows limited vanity numbers so you can search by word and cross reference with an area code. Choose your number carefully, because it’s not a good idea to change business numbers once you’ve started to advertise. Next, contact the provider you want to use and set up the business phone account. This is no different than opening up a personal account unless you need special features like multiple lines to support a switchboard. For small businesses, just one line will be fine. Link your new business phone account to whatever bank account you’re using so you can write it off as a business expense without complications. Assigning extensions is essential for an office. It allows you to transfer a call to someone else. You can usually set these up on your phone through the phone menu. Follow these simple steps to set up extensions on your office phone. Press the menu/set key. Scroll down the menu and highlight ‘phone setup/’ Press the “menu/set” key to choose that option. Scroll down the menu and highlight where it says “extension no.” and press the “menu/set” key again. Scroll through the available numbers or key in your desired extension number. Press “menu/set” key to save the extension in your phone system. Continue this process for any additional extension you need. When you’re finished, it’s a good idea to call the extensions to make sure that they were set up the right way. Press the “transfer” putting on the cal and enter the extension, then wait for that line to ring. When it does, you’ll know the extension is active. Figuring out how to get a business phone number and set up your business line might seem like a scary process, but it’s actually pretty simple when you get down to it. Having your own business line might not sound so important in the days of the cell phone age, but when you run an office, they’re essential for communication and functionality. For more information about phone systems and hardware, visit us today!